Bingo Cage Sets: Brass Bingo Cages, Bingo Chute Cages, Ping Bong Ball Cages and More! Our 9 Inch Round Bingo Cage features a shiny, durable brass coating. This Bingo Cage is great for bingo games at churches, schools, clubs, or in the home. 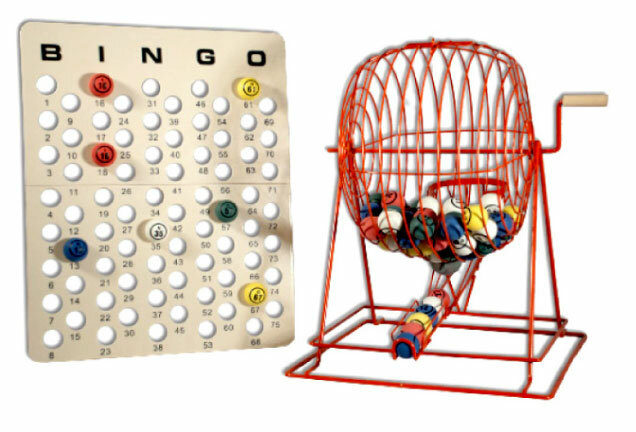 Each Brass Bingo Cage Set comes complete with multi-color plastic bingo balls and a masterboard. Sale Price: $42.50. Was $85.00. Save 50%. This 9 Inch Round Bingo Cage features a soft rubber coating that ensures long use. It is the perfect bingo cage for games at churches, schools, clubs, or in the home. Rubberized Bingo Cage Sets are available. Sale Price: $47.50. Was $95.00. Save 50%. 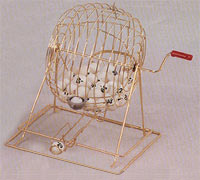 Our 19" Tall Ping Pong Ball Bingo Cage Set features a rounded brass bingo cage, 75 bingo balls, and a masterboard. This bingo cage set is great for bingo games at churches, schools, clubs, or in the home. This giant size Bingo Cage accommodated ping pong ball size Bingo Balls. With its overall red color, the Jumbo Ping Pong Ball Bingo Case Set is a real attention-getter! The Red Bingo Case measures 19" tall, and it features top-quality craftsmanship that ensures even and consistent bingo ball mixing every time. Each Jumbo Red Bingo Case Set includes 75 White Double Number Ping Pong Bingo Balls (or a similar set of single or double numbered white or colored balls) and a Plastic Ping Pong Bingo Master Board. 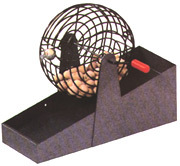 Our Chute Cage Set features a rounded rubber-coated bingo chute cage, 75 bingo balls, and a masterboard. This bingo cage set is great for bingo games at churches, schools, clubs, or in the home. 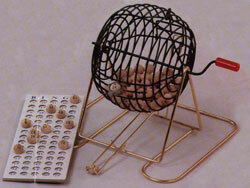 The Speedmatic Bingo Cage Set includes the masterboard and cage unit plus 75 7/8" wooden bingo balls. To use this bingo cage, simply put the bingo balls on the masterboard during the game. Then, once the game is over, press the lever and the balls roll back into the cage. Measures 16" x 16" x 30. ".